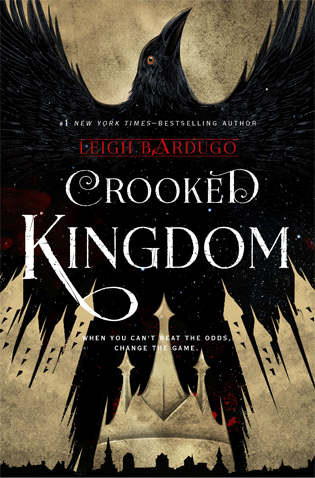 As you can’t really read Six of Crows without reading Crooked Kingdom (Young Adult 536 pages) by Leigh Bardugo, I read Crooked Kingdom in the same weekend when I borrowed both from my local library. So this book also started with a first chapter from a character who had really nothing to do with the main characters and their story, but is something that is mentioned as background knowledge throughout the story. I still think it’s an interesting way of starting a novel and it seems to be working out very well for this series but I’m not sure it’s something I would replicate in my own writing. While I didn’t mention it in my review for Six of Crows, one of the big draws of these two books for me has been how each of the characters are absolutely not neurotypical. What does that mean, you might ask. It means that each of these characters have to often battle their own mental health concerns in order to accomplish anything. In this book, there are characters struggling with gambling, drug addiction, anxiety, haphephobia (the fear of being touched), and a variety of other concerns many neurotypical people may not have exposure to. The characters are never magically cured of their mental health concerns, but with the support of the people who care about them and their own strength of will, they are each able to find positive coping mechanisms to make things more bearable. I think that says a lot about the positive message that even a dark and gritty fantasy series like this can have for readers – that life never has to be perfect, there are people who care about you who will love you just as you are, and you can survive just about anything and be better for it. Nina’s addiction to jurda parem is painful to read because it shows what kind of special hell withdrawal is for anyone trying to come off any type of massively addictive drugs. Reading about her struggle and how she treated everyone when the effects of the withdrawal impacted her the most was an accurate reflection of how people in that position will often do anything and everything to get more of whatever substance they crave. She sometimes treated the people around her, especially Matthias, horribly and she knew it but there was nothing she could do to change the physical impact of the drug’s withdrawal except wait it out and be as strong as she could. I have to say, that takes a lot of courage and she wasn’t always successful in behaving as well as she would have liked. Matthias and the rest of the crew helped her and supported her through everything and that was really moving. Nina really went through a lot in this book, as did all of the characters, but she also had to face something like a loss of identity, as she couldn’t use her Grisha powers anymore without severe repercussions. As she’d grown up with her Heartrender powers and those powers are a key identifying component to her former life as a soldier and member of her society, the loss of those powers impacted her to her very core. She also had to face her people again, standing side-by-side with the person who captured her and intended to take her to his people to watch their religious zealotry justify the genocide of her people. She had to defend the man she loved because of their separate cultures, at war with each other. There is a lot in this book about learning and growing and not judging other people based solely on the brainwashing of their culture or upbringing. And that applies just as much to our modern culture today as it does to this series set in a fantastical world. While the story itself was interesting, it’s definitely the characters who made this book and this series a worthwhile read. Overall, this book is a solid three on my rating scale and at some point, I might investigate adding this book and Six of Crows to my own collection. Bardugo, Leigh. Crooked Kindgom. New York: Henry Holt and Company, 2016. This entry was posted in Book Reviews and tagged Book Review, Crooked Kingdom, Leigh Bardugo. Bookmark the permalink.